Berlin is in the heart of Europe. And we are in the heart of Berlin. Germany's capital is a hub for political and cultural events, and a crossroads for travel in Europe and beyond. Located in the city's "Mitte" neighbourhood, the Hertie School is just minutes away from the Reichstag, the Brandenburg Gate and other important political and historic landmarks. Located in the city's "Mitte" neighbourhood, the Hertie School is just minutes away from the Reichstag, the Brandenburg Gate and other important political and historic landmarks. Students relax on the lawn in front of the German Federal Chancellery, just around the corner from the Hertie School. Newly-graduated Hertie School students pause for a group photo on the steps of the Konzerthaus at Gendarmenmarkt, Berlin’s most beautiful square. Though the origins of the Bear as a city symbol are unclear, bear statues can be spotted throughout Berlin. Calling all history aficionados: You don't want to miss out on Berlin's rich offerings. Here you see a historical mural from the GDR era, featured in the German Finance Ministry. The iconic Berlin Bear holds high a currywurst, grilled sausage served with curry ketchup and fries, one of the city’s signature snacks. 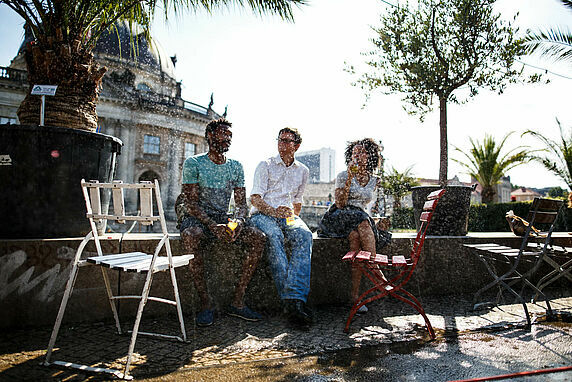 Berlin is a political hub: young, diverse and international. As the capital of Germany, Berlin is the epicentre for political decision-makers and policy debates. It's also a city where history is all around, a fascinating backdrop for studying public policy. 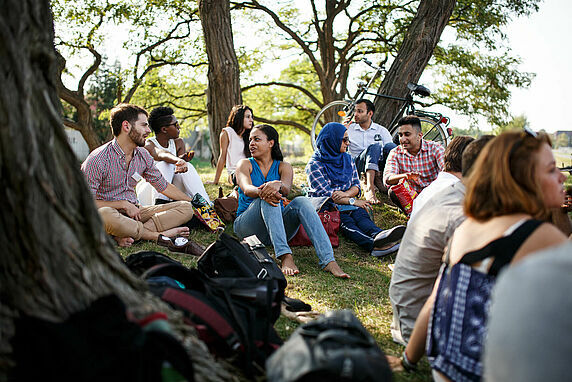 Berlin draws young people from around the world, bringing with them a diverse set of cultures, skills and activities. The Museum Island in Berlin's central Mitte district is a UNESCO World Heritage Site. 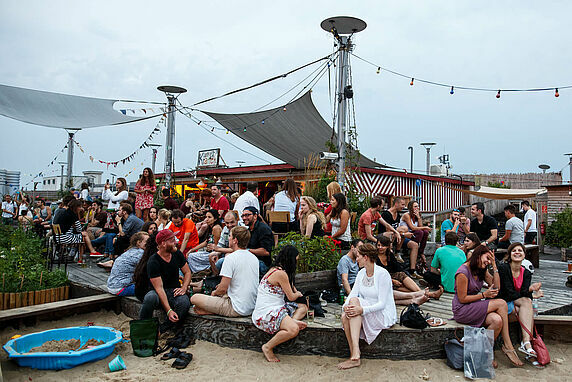 Berlin is known to have one of the best music and culture scenes in Europe. Parks all over the city offer plenty opportunities to relax and escape the streets. The Tempelhof Field (Tempelhofer Feld), a former airport right inside the center of Berlin, has been transformed into a park and offers space for many recreational sports. 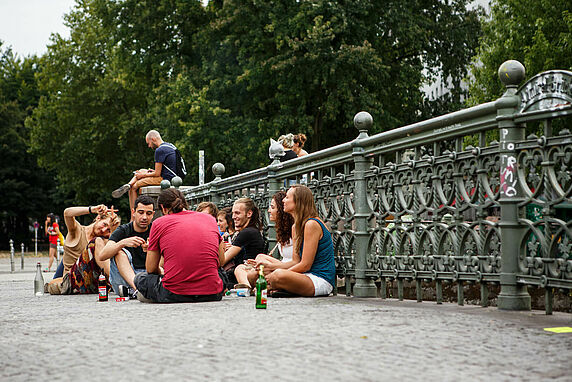 In summer, the Admiralbrücke on the Landwehrkanal in Kreuzberg is a popular hangout for Berliners. Rooftop bars offer spectacular views of the city and are a popular spot to enjoy the long summer nights. Berlin is affordable and easy to navigate. Among Berlin’s many assets is its affordability. Housing and general expenses are relatively lower than in many major capitals worldwide. It’s especially welcoming for students, with countless special discounts at many venues. It's also known as a very bike-friendly city, thanks to the flat landscape and many cycling paths. Whether on foot, by bike, public transportation or car, life in Berlin is accessible and easy-going. The Oberbaum Bridge (Oberbaumbrücke) connects Berlin’s Friedrichshain and Kreuzberg neighbourhoods. It's also offers a great view of the Molecule Man. The Molecule Man sculpture on the Spree river marks the spot where three neighbourhoods intersect: Friedrichshain, Kreuzberg and Treptow. The East Side Gallery: The wall that once divided has become a canvas for artists from around the world to express their creativity. 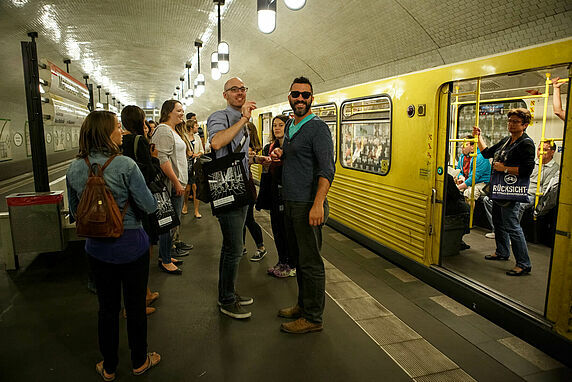 Berlin has a comprehensive public transport system with busses, trams, underground and surface trains. However, if you prefer alternative forms of transport, bike - or even skateboard - should get the job done on the city's many bike lanes. 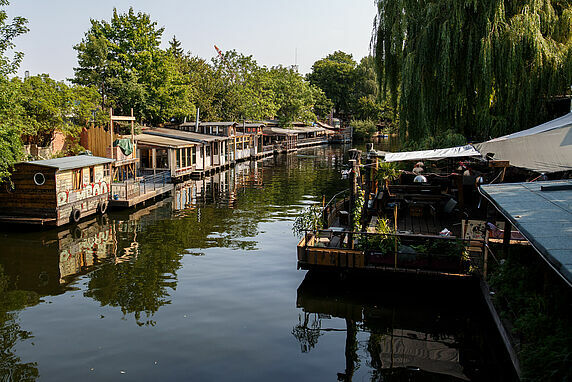 In Summer, Berliners make the most of the Spree river. "Beach bars" pop up all over the place and those who are lucky enough to own a boat, spend as much time on it as they can. Studying can be stressful at times. 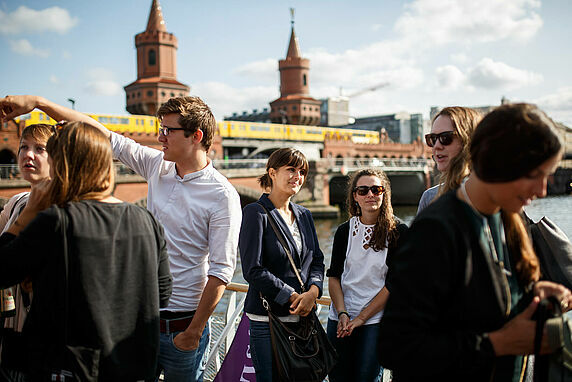 Berlin offers many ways to escape the stress for a moment and balance your degree and social life.